NOTE: We are 100% operational for all Mt. 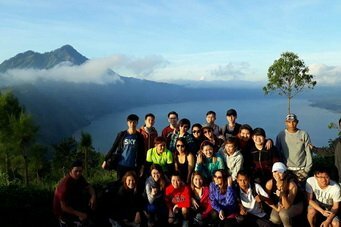 Batur treks. Indonesia’s Center for Volcanology of Geological Hazard Mitigation (PVMBG) suggests a 12 km exclusion zone around Mt. Agung. Mount Batur is well outside this zone so you are always at a safe distance throughout your trek while getting the best views on the island. Feel free to contact us with any questions. Get the once-in-a-lifetime experience of seeing a live volcano erupt across the horizon while you remain at a safe distance. You’ll be well outside of the exclusion zone at all times and the off shore trade winds at this time of year ensure that the ash blows in the opposite direction of Mt Batur. Your views are not only spectacular, but clear and safe. Additionally, our guides are licensed and experienced and make your safety their number one priority. 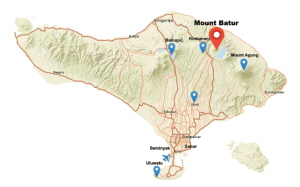 Mt Batur is part of UNESCO’s Global Geopark Network and is a sight on it’s own. The panoramic view from the top is spectacular. Many guests rate this hike as the best experience of their Bali vacation. Once you’ve booked this trek, your friendly, English-speaking driver will pick you up at your hotel lobby and drop you off at the base of the mountain where you’ll meet your guide and receive a short safety briefing. Here we’ll answer all your questions about Mt Batur and the Mt Agung eruption. Our licensed guides live in this area with their families so you’ll be getting an experienced professional who knows the trails and volcanos better than anyone. From Toya Bungkah village, you’ll begin your hike before dawn and trek safely at a pace that suits your group. From the summit you’ll watch the sky turn from dark purple to a multitude of colors like sapphire blue, burnt orange and sassy pink as the sun rises over the eastern ocean and the ash from Mt. 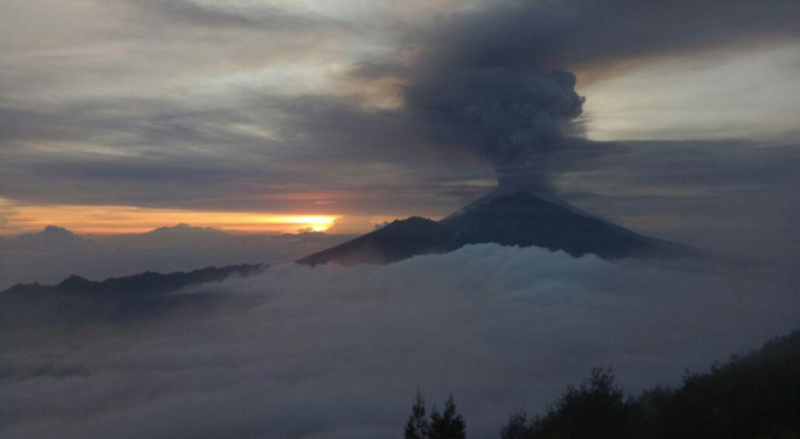 Agung provides spectacular formations. A refreshing breakfast, coffee, tea and water will help to prepare you for the trek back down the mountain where you’ll see recent lava flows from Mt Batur’s own past eruptions. Yes, Mt Batur is a live volcano as well, but scientists have determined that there is no pending eruption like the one on Gunung Agung. 01.40-03.00 AM: Pick up time (depends on your hotel location). 03.45 AM: Arrival at the starting point in Toya Bungkah village. 05.45 AM: Arrival at the summit of Mount Batur (sunrise point). 07.00 AM: Continue our trip around the rim of the crater. 07.30 AM: Begin our descent to the finishing point of our trek (Toya Bungkah village). 09.00 AM: Arrival at Toya Bungkah village where you’ll board the bus back to your hotel. 10.00 AM: Stop off at a Balinese coffee plantation. 11.00 AM: Approximate arrival at your hotel. US $55.00 per person (minimum 2 people per group). Your fee includes the IDR 100,000 to enter the park. Since we give personal tours and do not join with other groups, we must add a 50% charge for solo travelers. It is recommended that you bring extra money for shopping. Tipping is not required, but is always appreciated if you enjoy your trek. You may cancel this trek 4 days in advance and receive a full refund. If you cancel three days in advance, you will receive a 50% refund. We regret that cancellations that occur on the day of or the day before your scheduled trek are not eligible for a refund. This is due to lost revenue for treks that would have otherwise been able to book. Thank you for your understanding. Of course, we encourage all guests to contact us prior to booking in order to discuss our cancellation policy. You can bring a clean shirt or towel if you think you may want to change after the hike. Since we have not yet confirmed the exact location of your hotel, pick up times are approximate. We understand that you have invested a lot of time and money in your trip to Bali. We want to help make your holiday as enjoyable as possible and we are excited to share with you our beautiful landscape, customs and culture. We promise to deliver an experience that is beyond your expectations and will take special care to address all your concerns and to accommodate all your needs while you are with us. We understand that a careless accident can impact your vacation in a negative way. Therefore our drivers are all licensed and drive safely to and from your destination. Our guides are experienced and knowledgeable, knowing the hazards and risks with each climb as well as the limitations of some of our guests. For your safety we will always err on the side of caution. Is it safe to trek Mt. Batur at this time? Yes. Clearly al treks to Mt Agung have been cancelled but the eruption has provided a great opportunity for travelers to see a live eruption from a safe distance on Mt Batur. Do we really need to hire a guide for this trek? Yes, but you’re in luck. 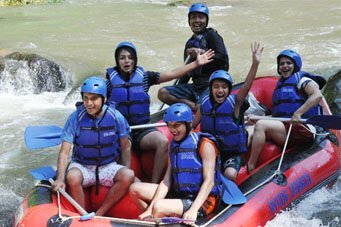 Bali Trekking Exploration guides are licensed and highly experienced. We know all the hidden photo opportunities and special trails. We’re also trained in first aid and emergency evacuation procedures. Finally, our guides are among the highest rated trekking personnel in Google and Trip Advisor. 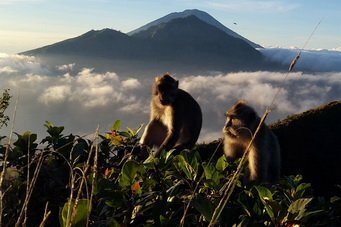 Can we camp on Mount Batur? Yes. 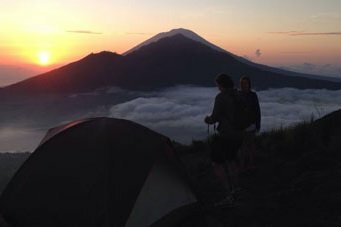 Camping on Batur is a lot of fun and you get to wake up to some spectacular views. 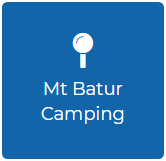 Please go to our Batur Camping page here or contact us at trekkingexploration@gmail.com. Are you sure I will see the eruption? If you book now, yes. The eruption is happening right now and is expected to go on for another few days, but book as soon as possible to get the best views and photo opportunities. Though we have the highest safety standards of any guides on Mount Batur, sometimes accidents do occur. In the case of evacuation or other serious injury, the local rescue team will be immediately notified to respond to the emergency. The injured person will be cared for and taken to a hospital if necessary. Our guides are trained to notify family or friends of the injured person as soon as possible and to insure all steps are take to get them treated quickly and safely. Will there be a lot of other trekkers? The Guning Agung eruption has certainly cut back on the number of people traveling to Bali so there are fewer trekkers than normal, but there will still be a few other travelers. No worry, our guides know the best trails to avoid the crowds. Trekking volcanoes is not recommended for those who have a serious fear of high places. Even though Mount Batur is an easy climb in respect to other mountains in Bali, it is 1717 meters above sea level. Please keep this in mind before you decide to book your trek. As always, we are happy to answer any questions you have. Please contact us here for more information. 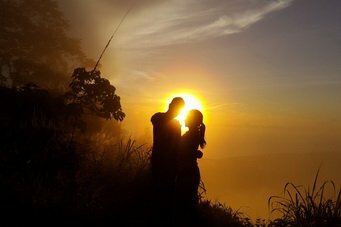 Is Mount Batur an active volcano? Yes. The last eruption was in 1999-2000. International scientists study the volcano so it is highly unlikely that an eruption would occur without warning. Please use the form below for booking or to ask general questions. A guide will contact you to confirm your reservation or to provide requested details. A sunrise trek atop spectacular Mt. Batur with experienced English-speaking local guides. 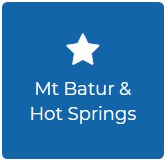 After watching the sunrise atop scenic Mt Batur, soothe your muscles in natural hot springs. Two adventures in one day - a Mt. 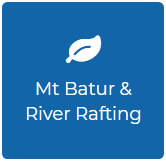 Batur sunrise trek followed by white-water rafting. 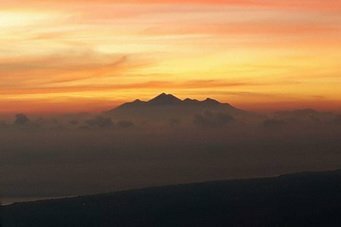 Trek up the highest and holiest mountain in Bali for an incredible sunrise view. Watch the sunrise over the volcanic valley of Mt. Batur and the Caldera, the crater formed from the volcano. Hike the day before, camp and awake to the beautiful sunrise atop Mt. Batur. Hike along the caldera of volcanic Mt. Batur. 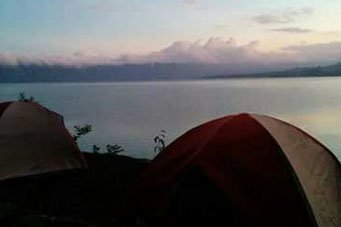 Camp along the lake and wake to a sunrise view.